Cost: $50 registration fee, plus $300 fundraising minimum – fully-supported event includes t-shirt, snacks, food truck lunch, post-ride party and dinner with wine & beer! Experience the beauty and spirit of the Buzzards Bay region in autumn at the 12th annual Buzzards Bay Watershed Ride on Sunday, September 30. 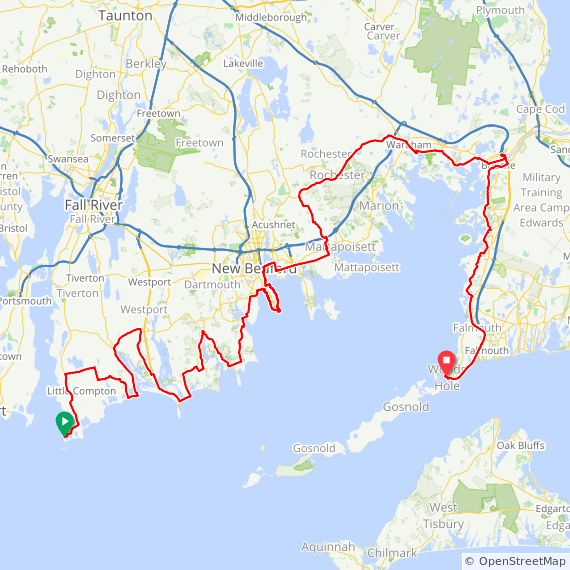 Choose from three celebrated 100, 75, and 35-mile cycling routes that wind through farmland, coastal villages, cityscapes, cranberry bogs, and the back roads of Cape Cod to end with a waterfront finish line party in beautiful Woods Hole. All riders are fully supported with friendly volunteers, local food and beverages all day, and SAG wagons with ace traveling bike mechanics and First Aid. $50 registration fee includes five water stops, a hearty food truck lunch at scenic Eastover Farm, a dinner buffet with beer, wine and live music, and awards and prizes for top fundraisers and best team uniforms. Each cyclist is required to raise a minimum of $300 to support the Buzzards Bay Coalition’s work to protect our local environment. Team participation welcome and encouraged! Join us to “Bike for Clean Water” in October.